Anyone who pays the slightest attention to the ingredient lists of most of the food items sold at the conventional grocery stores across this country would know this, except the American consumer seems to do very little research while buying things that go directly into her body. This is why we need more investigative reporting and more documentary films on the subject of food. 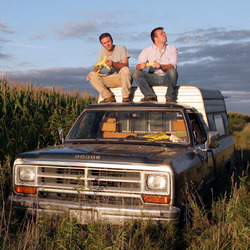 This is why King Corn, directed by Aaron Woolf, Ian Cheney and Curt Ellis, is important viewing for the average American consumer. In King Corn, Woolf, Cheney (we hope of no relation the Cheneys of Wyoming) and Ellis spell out in very basic terms, what has gone so wrong with American agriculture and its direct product, American food. They present their hardest evidence first: Ellis and Cheney have their strands of hair analyzed at the University of Virginia. The result: the carbon in their bodies originated from corn. The two Ivy League grads seem shocked and appalled. They run to the grocery store and start reading labels of their favorite food products such as Twinkies and apple juice. They find out the obvious — most packaged foods in America contain some derivative of corn, whether it comes in the form of corn oil, the infamous and ubiquitous high fructose corn syrup or the mysterious xanthan gum. Instead of doing the East Coast elitist exposé composed of interviews with nutritional and agricultural talking heads (which does happen in small bits in the latter half of the 90 minutes), the directors take a softer, more personal approach to the controversial subject. These two friends from Yale, it turns out, have a common link to Greene, Iowa. Both of their great-grandfathers lived there and were involved in farming. So their journey has a human-interest angle. They go back to Greene, not only to experiment with growing an acre of corn, but also to reconnect with ancestors and remaining long-lost relatives. The corn-growing portion of the story gets eerie very quickly. When they lease an acre on a farm, Ellis and Cheney find out that regardless of what their yield or profit, that they are entitled to $28 in subsidies from the government. That’s thanks to former Secretary of Agriculture Earl Butz, who in 1973 decided that it was stupid to pay farmers not to grow things and that all farmers growing certain things (i.e. corn, soy beans, cotton) should get a handout from the government. A mere twenty-eight dollars for a year’s worth of work for the co-directors of King Corn may not sound as much, but when one thinks of the gigantic agribusinesses planting thousands, if not millions, of acres at a time, it’s amazing to imagine the extra kickback they get from the government — $28 million on top of annual profits would be nice, wouldn’t it, now? As much as the USDA has continued its efforts to make the subsidies look like a safety net for the small farmer keeping us all fed, Ellis and Cheney quickly find out that even in Greene, Iowa, more and more small farmers get out every year and the big farms only get bigger. In fact, just ask your local vegetable grower at the farmer’s market how much of a subsidy they get. Very little, if at all. The small farmers, who really feed us, keep an ecological diversity and practice sustainable agriculture are ignored, while the large commodity crop growers get all the taxpayers’ money. Ellis and Cheney turn to one of the most famous food experts we have in the country today – journalist Michael Pollan – to explain what’s going on. “Industrial corn was made so that plants could tolerate living in close quarters,” he says. With the advanced technology, Ellis and Cheney calculate that their yield will be four times as much as their great-grandfathers who farmed in Greene. This, however, is when they walk straight past the 800-pound gorilla in the room. Ellis and Cheney plant genetically engineered corn and buy chemical herbicides that kill everything in sight except for their corn (which was engineered to resist it) but they do not go into any sort of conversation about the companies who have been shoving these products down the American farmer’s throat. No mention of Monsanto or Bayer or any of the other seed/herbicide companies. It leaves a giant hole in this film’s overall thesis and plot. Deborah Koons Garcia’s The Future of Food was much more substantive in this respect. Instead, the two return to the field to do a taste test. It tastes like “cardboard, chalk, crap” is their ultimate finding. This genetically engineered corn is not the type to be sold in grocery stores for summertime grilling. It’s commodity corn and would have to be processed before consumed. Ellis and Cheney throw out some good statistics at this point. Out of the one acre of corn they grew, one third will go into ethanol, one third to making sweeteners such as high fructose corn syrup, and one third will become animal feed. The part on animal feed is by far the film’s strongest. Ellis and Cheney learn that 60 percent of all cattle ration in confinement feedlots is corn. The problem with that? Cattle cannot sustain a corn-heavy diet for too long. They would die in 180 days. Luckily for the cows, their lifespan in a confinement feedlot rarely exceeds 140 days. The filmmakers head out to eastern Colorado to paint the graphic picture about beef consumption in the U.S. as we know it. What used to be the grasslands of Colorado (the natural food source for cattle) has been turned into cornfields to provide the cheap, high-protein diet that fattens cows up quickly and makes them available for slaughter as fast as American consumers demand it. But because the corn diet makes cows so sick, their feed now also contains high amounts of antibiotics. Ellis and Cheney mention one result of this satanic business formula: A 100,000-cattle feedlot produces as much waste as a 1.7 million-population city. What they fail to mention are the problems humans have with overexposure to antibiotics through their food, i.e. an increase of antibiotics-resistant viruses and diseases. Ellis and Cheney’s next stop on the journey with corn is high fructose sweetener. They do not get permission to film any factory making it, so they decide to make some at home. If the viewer is not scared out of her wits by the protective wear the duo has to wear while cooking up the stuff, their final taste test should be enough to give anyone second thoughts about carbonated soft drinks. Neither one manages to swallow a sip of the homemade sweetener. In the end, the filmmakers have to turn to the talking heads to make sense of their journey. Pollan points out that a McDonalds meal is made entirely of corn: The beef is cornfed, the French fries are cooked in corn oil and the sodas are sweetened with corn syrup. Walter Willett, the Harvard University nutrition guru, explains that Americans are drinking more calories than ever before and that high consumption of corn sweetener is not only linked to high obesity, but also Type 2 diabetes. At the end of King Corn and all of its bonus materials, one is left to wonder how many meals made of cheap and crappy tasting ingredients, how many meals that have so many ill affects it will take until American consumers revolt against agribusiness and demand a return to purer, more sustainable farming ways and to purer, healthier food. 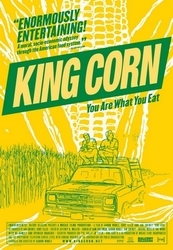 King Corn doesn’t teach foodies and sustainable agriculture advocates anything they did not know before. However, it’s a gentle introduction for the average American consumer into the nightmare that food production has become in this country. It’s perhaps with people watching films like King Corn that we’ll have enough American families to stand up and take back their dinner plate from the jaws of companies such as Monsanto, Cargill, ADM and Bayer. The makers of KING CORN and Docurama Films have teamed up to bring you the groundbreaking documentary on iTunes! Click below, and you will be brought straight to the iTunes store for viewing! Hey thanks for the great review. Although you posted it in 2008, I just read it in 2012 – the magic of ‘teh Internets’. I remembered the quote by Senator Chuck Grassley, and you helped me fix the source for it in my own research.